As The Grubworm is two years old it feels like it’s time for a bit of a refresh, hence the new look. Expect more small changes over the coming weeks as the blog evolves. It’s January, traditionally a time of restraint and moderation. And so I thought I’d kick off 2012 with something healthy and tasty. Spinach for the iron and vitamins, and quinoa because it’s damn tasty (and makes a change from cous cous or rice). Although it’s been banging round the UK for a while, I only discovered quinoa while in Peru. They serve it in soups, with meat, as part of salads. It’s everywhere. My first bite was a bit of a revelation. The taste is somewhere between Puy lentils, bulgar wheat and wild rice. Lightly nutty with a pleasing bite. It goes brilliantly with the silky softness of spinach, and you could always add a poached egg instead of creme fraiche and maybe some bacon if you felt the need for more salty goodness. Change the spice to your hearts content, this is an everyman sort of dish. So happy new year, it feels like a year of promise and excitement. There’s the distinct whiff of adventure on the horizon, thoughts of a new home are becoming a reality, and so there’ll be a whole new area to explore. I hope it’s a great year for everyone, equally full of adventure, fun and, of course, fine food. Cook the quinoa in boiling water for about 13 minutes and drain. Heat a couple of tablespoons of oil in a wide pan over a medium heat and add the onion, cooking it until it’s soft. Add the garlic and hazelnuts and cook for another minute. 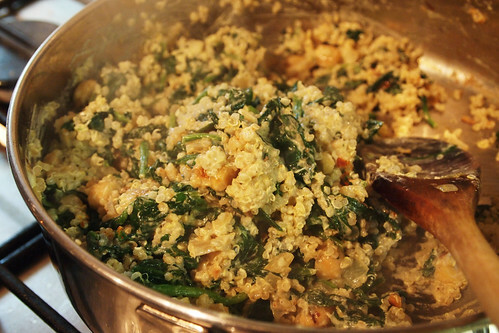 Stir in the spices and then start adding the spinach one handful at a time. 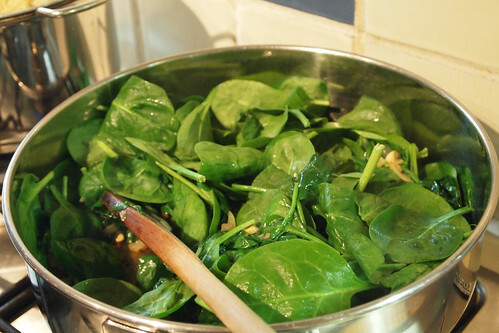 As it wilts add more until you have cooked all the spinach. Dollop in the creme fraiche, stir through and add the quinoa. Reduce the heat to low, season with some salt and pepper, stir everything together, and cook fro a couple more minutes. Serve with some more Ras El Hanout and perhaps a little sumac sprinkled on top. Great new look, I really like it. Splendid recipe to kick off the new year with too – love to do it but it’ll have to be just for me or altered as Joe Brown is allergic to spinach. Quinoa and I haven’t seen eye to eye yet. I’m willing to give some more recipes a go before I file it in the back of the cupboard. Spices and creme fraiche might just do the trick. @Vintage Macaroon – i really like the nutty texture of it, it seems to work well with some sort of fat – butter, creme fraiche, cheese etc – stirred through it. Spice also helps And it is dead healthy. As for the new look, it’s a start, but I need to let it evolve a bit more to add some more personality to the site, but it is getting there. Like the new look! Now I’m sure this virtuous recipe is damn tasty but January is a tough, tough month. So please, please can your next recipe be a bit less healthy? I’m thinking pie, maybe?! Great new look – bring on the other small changes. The receipt looks delicious – I shall have to try the quinoa – sounds like something I would really like, especially the slightly nutty bite. Looking forward to your new year postings. I sadly never tried (I think) quinoa before Bolivia/ Peru and after it I ate it a lot more. I still don’t think I have had better than they managed over a rusted old pot half way up a mountain despite adding lots of waitrose ingredients but I think this could do it. Like the new bold bright look btw. The Flickr plugin doesn’t seem to work on my screen? @Mr Noodles – Thanks, it still needs some work, but i am on the right path. And don;t worry, there’s going to be a proper slow-cooked, melt-in-yer-mouth beef and stout recipe coming up soon. @Kathryn – thanks! I think quinoa is definitely worth trying, it’s mega-healthy too. @Tom – Me neither, i was just vaguely aware of it as something a health-food-shoppy. The first bite was something of a revelation. Eating it in the right environment (ie half way up a mountain) also adds something to it. It was the same with bean stews and the alti plano, something about the high altitude cold made it taste ten times better then any other bean stew i’ve eaten. Maybe you should try it with some Korean spice? I reckon it would be a great match (to be eaten with beer and bbq?). Thanks for the Flickr heads-up. That will probably be going anyway (might replace it with something a bit different). Ooooh loving the new look! Spinach and quinoa looks fab to me! Healthy food doesn’t have to taste bad, this looks yum. I actually love quinoa, have about half a bag left in my larder. I know it sounds very much like a health-food vegan experiment kind of thing, but really, everyone ought to give it a go, it’s kind of liek cous cous, but nuttier. @Shuhan – thanks! You are so right re healthy food tasting good – so much of it does. I agree with your description of it too, like cous cous, only slightly more tasty and less processed. I’ve not really tried quinoa much, this looks like something to urge me to give it a go. Lovely new look too! I’m quite a fan of quinoa, but then I like most of these types of nutty grains. This recipe looks lovely – I’ve been trying it out stir fried with vegetables, chilli and Sichuan pepper. Turns out really well. But then Sichuan pepper makes everything better. @Sharmila – ooh, i like the idea of adding some sichuan peppercorns, that would really add some excitement to the dish.